Diana Rattray. The Spruce Eats, 2015. 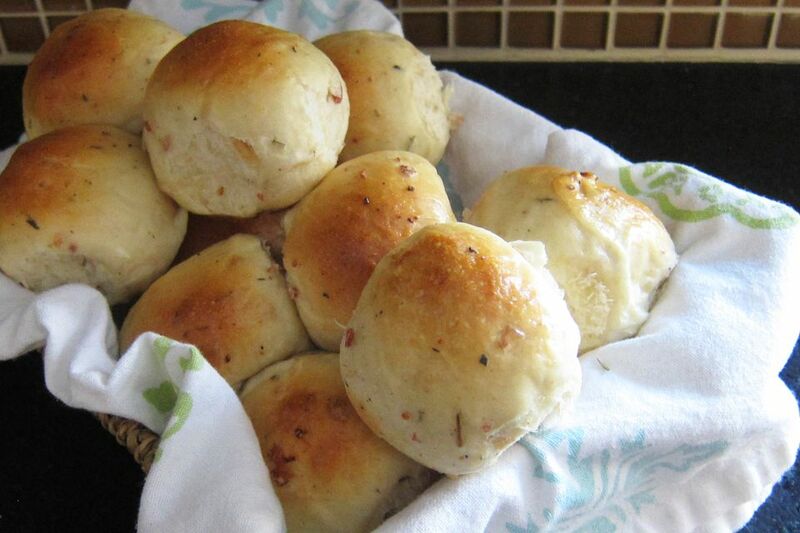 These savory herb and bacon yeast rolls are a mouthwatering combination of bacon and herbs, perfect for making a dinner roll or shaping and baking as sandwich buns. They are incredibly delicious. Bake the herb and bacon rolls for a holiday meal or Sunday dinner, or shape them into buns for lunch or breakfast sandwiches. In a cup or small bowl, dissolve the yeast in the 1/4 cup of warm water; set aside. In a large mixing bowl combine the milk, sugar, salt, garlic powder, celery salt, melted butter, thyme, rosemary, egg, and 2 cups of the flour. Add the yeast mixture. Beat until smooth using a whisk or the paddle attachment of a mixer. Stir in the remaining flour and the bacon. Transfer the dough to a floured surface and knead for 8 to 10 minutes, until the dough is smooth and elastic. Or, use a stand mixer with dough hook attachment. Generously butter a large bowl. Gather the kneaded dough into a ball and place in the bowl. Turn to coat all sides with butter. Cover the bowl with plastic wrap and let the dough rise in a warm, draft-free place for about 1 1/2 hours, or until doubled in bulk. Punch down the dough and cut it into 24 uniform pieces. A kitchen scale is an excellent way to keep them even in size. Shape the pieces into smooth, taut balls. Arrange in the greased baking pan. Cover with a lightweight kitchen towel and let the rolls rise for about 45 minutes to 1 hour, or until nearly doubled in bulk. Lightly grease a 13x9x2-inch baking pan. Heat the oven to 400° F.
In a cup whisk the egg and 1 tablespoon of water together to make an egg wash. Lightly brush some of the egg wash mixture over each roll just before baking. Bake the rolls for about 15 to 20 minutes, or until golden brown. The rolls should register about 185 F to 190 F when done. If you usually fry your bacon, try baking it instead. There's less mess and spatter, and you have nothing to do but wait for the oven timer.